“My husband had left me when I was at my weakest. I had a newborn son to look after with no home and no money. If it weren’t for my mother and sister who took us under their care, we would have died from hunger a long time ago. Now, my son, my only solace, has cancer. 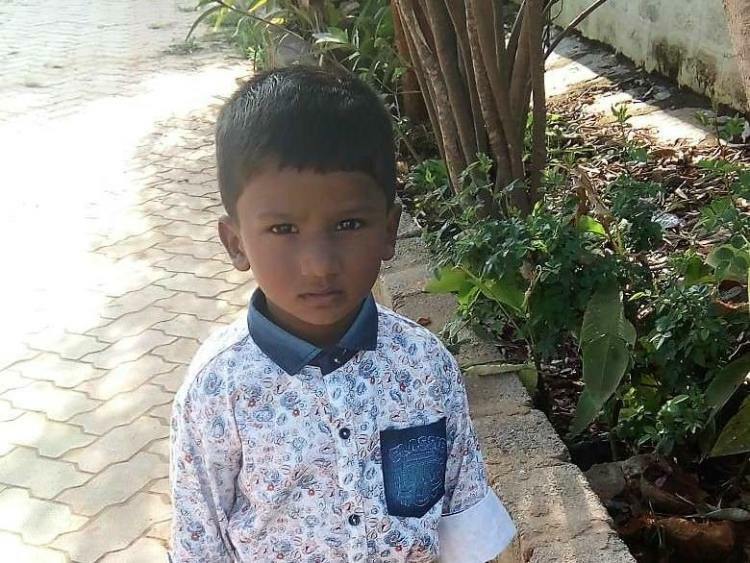 I don’t have money to save him,” –Naeema, Afnan’s mother. Naeema and Afnan lived with Naeema’s mother, Mumtaz, in a small two-room house in Hosur, Karnataka. Despite her age, 60-year-old Mumtaz made enough money to feed them by selling firewood, with Naeema’s help. 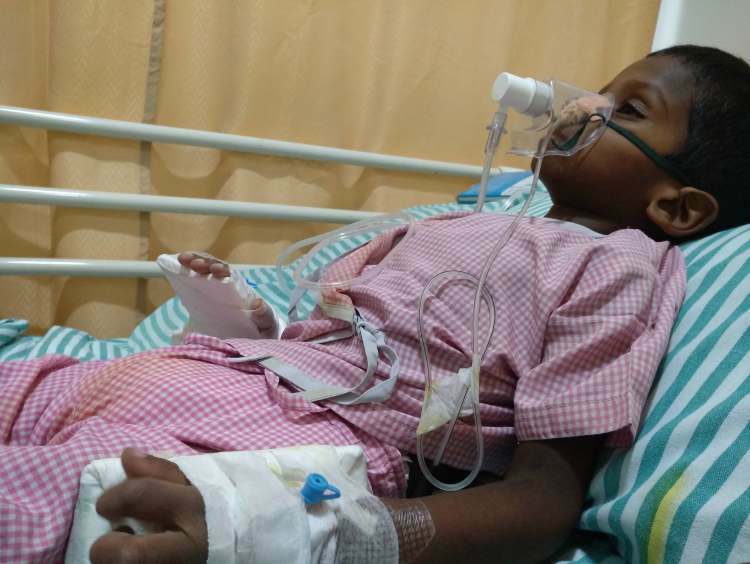 Everything was fine for three years until Afnan got a fever that persisted for days. 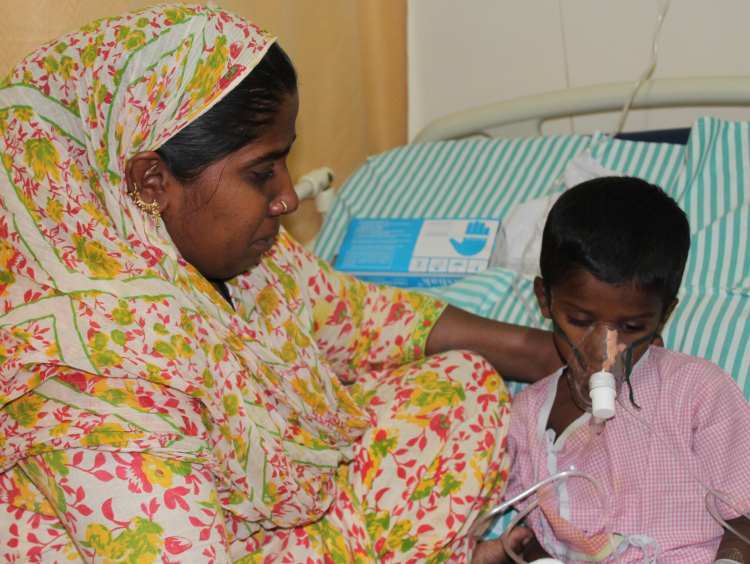 Naeema saw Afnan’s health deteriorate quickly, in a matter of just two months. He had just started to speak clearly and in long sentences when he was silenced by this dangerous disease. He does not speak much now. He is fatigued and restless. A good night’s sleep is hard to come by, for both mother and son. “We used to survive only on simple rice-sabzi. He would enjoy it and ask for more. Today when I see him getting fed through tubes, I am blank. I don’t know what I am feeling because I am blank. Fear and sadness have numbed me. How will I save Afnan? I have no jewelry or property to sell”-Naeema, with tears in her eyes. Naeema’s sister Naaz lives in a small rented apartment with her four-member family. Her husband is a driver and his salary is barely enough to feed his own family. Despite financial issues, Naaz did not shut the door on her sister’s face. 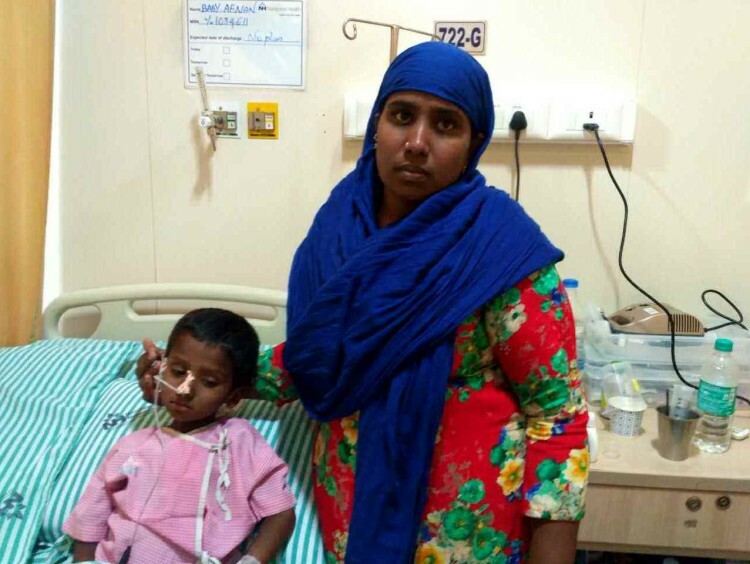 She was the one who helped Afnan get admitted to a hospital in Bengaluru. 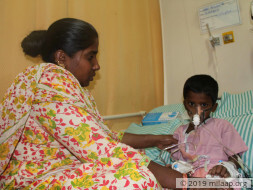 Naaz wants to save Afnan at any cost, but her own financial limitations stop her from doing so. “I don’t know what I would have done without my sister. She is fighting a battle of her own but she did not abandon me. My mother and sister gave me some money from their savings, but even that is not enough even for his medicines. 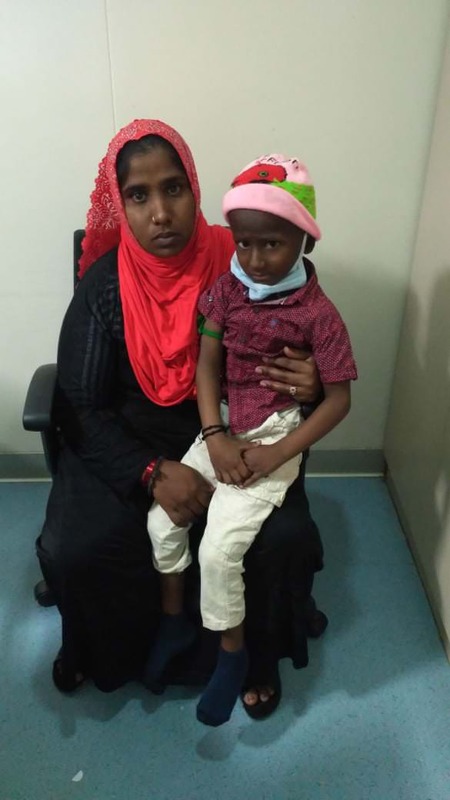 He needs chemotherapy urgently or I will lose him” –Naeema, Afnan’s mother. “I want to call him and tell him that our son is sick. But it has been so long. I don’t know if he even remembers that he has a son. I want to tell him that we are suffering and ask him to help us. But I don’t know his whereabouts. He had left one day, without even saying goodbye. Now I am left to save our son on my own,” Naeema tears up. 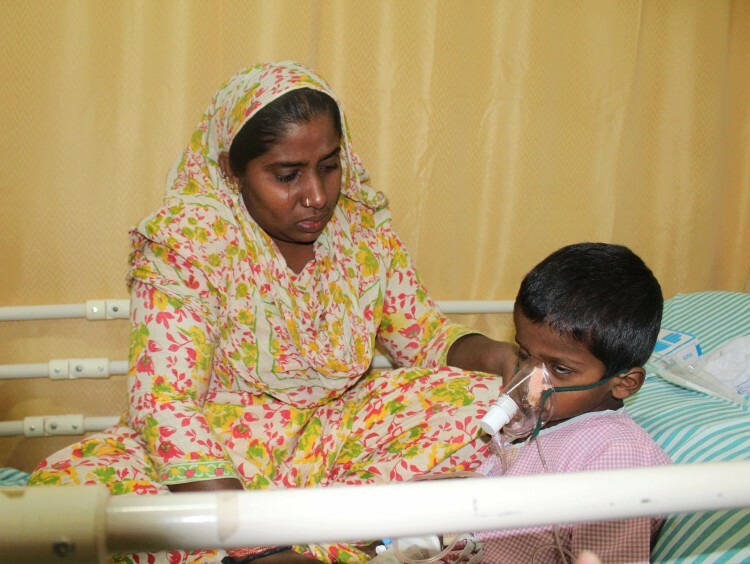 Naeema and 3-year-old Afnan are waiting in the general ward of the hospital for help. Afnan is very vulnerable to infections now, but they cannot afford a private room, let alone Rs 12 lakhs needed for his chemotherapy. “I am trying to be both a father and mother for Afnan now. I am comforting him on one hand, and on the other I am begging people to help me. I am a class 6 pass. I do not know a lot about how things work, but I will try until my last breath to save him. I was pinning all my hopes on my son after his father left. Now, if anything happens to him, I will die too because I will have nothing more to live for.”-Naeema. 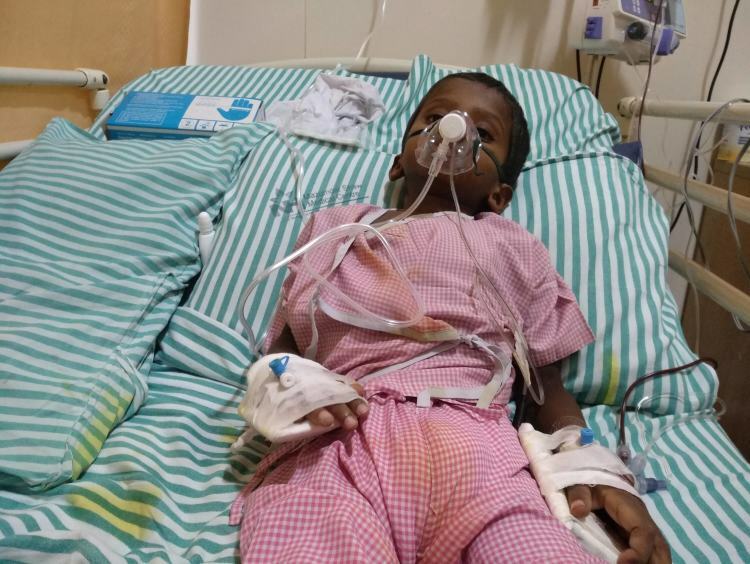 Afnan is currently in the hospital. 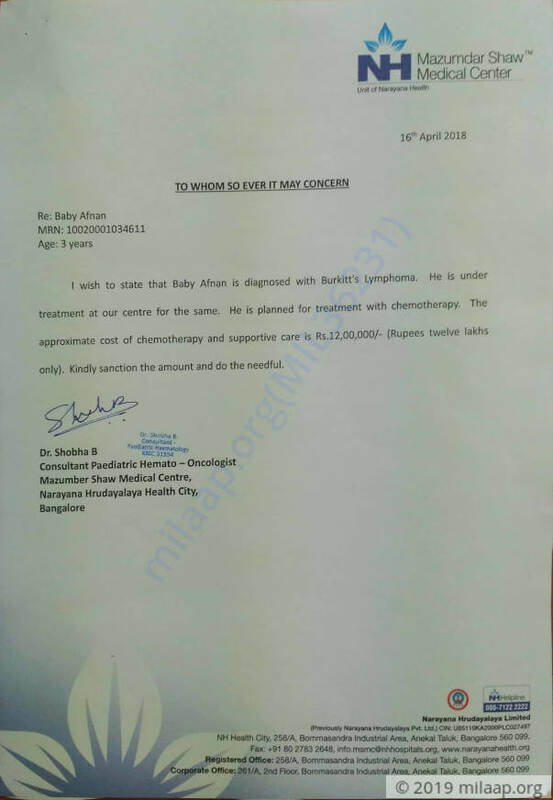 He is undergoing chemotherapy and is responding well to the treatment. We shall keep you posted. Afnan is currently on maintenance chemotherapy post radiotherapy. He is responding well to the treatment. Afnan has successfully completed 2 cycles of chemotherapy and requires another two cycles post which he will undergo radiotherapy. He is responding well to the treatment.